The massacre at an Orlando gay nightclub early this morning has been described as a "domestic terror incident," with at least 50 dead and 53 injured, officials said, making it the worst mass shooting in U.S. history and the deadliest terror attack on U.S. soil since the events of Sept. 11, 2001. The shooter has been identified by officials as Omar Mateen of St. Lucie County, Florida, a U.S.-born citizen with Afghani parents. After the shooting began, he called 911 to pledge his allegiance to ISIS, according to law enforcement officials. ISIS supporters have cheered the massacre online and an ISIS communique referred to the shooter as an ISIS "fighter," but there's no evidence that ISIS directed or had prior knowledge of the attack, terrorism observers told ABC News. Officials announced at a morning news conference that the death toll of the attack had risen to 50 dead, more than doubling what had been reported earlier. Orlando Mayor Buddy Dyer called today "the most difficult day in the history of Orlando" at news conference this afternoon. "At this time we're looking at all angles right now," an FBI official said. "We do have suggestions that that individual may have leanings towards that, that particular ideology. But right now we can't say definitively, so we're still running everything around." The FBI also said Mateen "was organized and well-prepared," adding "he is not from this area." Mateen's parents were born in Afghanistan, and he was "on the radar" of U.S. officials for some time, but was not the target of a specific investigation, law enforcement officials told ABC News. A police officer working at the club exchanged fire with Mateen outside of the club at 2:02 a.m., officials said at the news conference. Mateen then entered the club. It turned into a hostage situation shortly thereafter, when Mateen took hostages. He was armed with an assault rifle, handgun and "some kind of device on him," officials said. At approximately 5 a.m., the SWAT team made the decision to rescue the hostages, officials said. The shooter was killed in a gunfight with those officers. 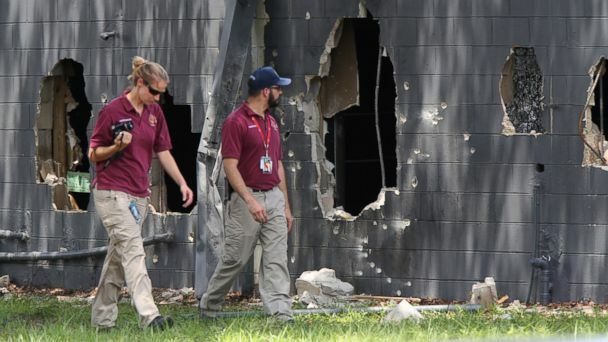 Eleven Orlando Police officers exchanged gunfire with the shooter, according to an FBI spokesman. There were about 320 people inside the club at the time of the shootings, officials said. Then at 5:53 a.m. Orlando police tweeted, "The shooter inside the nightclub is dead," referring to Pulse Nightclub, which bills itself on its website as "Orlando's Premier Gay Night Club." "This can be classified as a domestic terror incident," Orange County Sheriff Jerry Demings said at the news conference. The Florida Department of Law Enforcement is investigating this morning's shooting as "an act of terrorism." It said it will determine whether it is "domestic or international" terrorism. In a statement issued around 9 a.m., the White House said, "Our thoughts and prayers are with the families and loved ones of the victims. The President asked to receive regular updates as the FBI, and other federal officials, work with the Orlando Police to gather more information, and directed that the federal government provide any assistance necessary to pursue the investigation and support the community." Orlando Mayor Buddy Dyer said at a news conference earlier in the day that "many lives were lost." Orlando Chief of Police John Mina added that "approximately" 20 people we killed, and "at least 42 people" were transported to various hospitals. In an interview with ABC News' George Stephanopoulos following the news conference, Dyer clarified the initial figure, saying the number of dead was "probably in excess of 20 dead." Orlando Regional Medical Center, located near the nightclub, said it received "several gunshot victims," in a statement released at 5 a.m. The statement read, "Orlando Regional Medical Center was placed on lockdown around 2:00 a.m. after receiving several gunshot victims. Only essential workers are being allowed access into the building. Out of an abundance of caution, Arnold Palmer Hospital and Winnie Palmer Hospital have also been placed on lockdown." The hospital, as well as two other area hospitals remained in lockdown, as of 8 a.m. Sunday. Word of the situation spread shortly after 2 a.m., when Pulse Nightclub posted on its Facebook page, "Everyone get out of pulse and keep running." Police followed up by tweeting, "Shooting at Pulse Nightclub on S Orange. Multiple injuries. Stay away from area." Orlando Police tweeted around 4:30 a.m., "This is a fluid scene and we are working on getting you an update." The next significant update was at 5:48 a.m., five minutes before announcing the shooter's death, when police tweeted, "We can confirm this is a mass casualty situation. Support from local/state/federal agencies." The FBI was among the agencies at the crime scene, as was the Orlando Fire Department's bomb squad and hazardous material team. There was a controlled explosion near the shooting scene, but police said it was caused by a device intended to distract the shooter. Police also said the shooting was not connected to Friday's fatal shooting, also in Orlando, of "The Voice" singer Christina Grimmie. Rep. Alan Grayson, of Florida's 9th District, said during a news conference this morning that the attack was ideologically motivated. "It's no coincidence the attack took place where it did and when it did," he said in reference to the fact that Pulse was a gay nightclub. Florida Gov. Rick Scott spoke at a news conference this afternoon and asserted that "this is clearly an act of terror" and added that he has declared a state of emergency in Orange County, Florida. The state of emergency ensures the resources that are needed by the city from the state would be made available immediately, the governor said. Later in the day, President Obama called the Pulse massacre "an act of terror and an act of hate." He called Mateen "a person filled with hatred." He also stressed the resilience of the people in his state. "We're going to do everything we can to help bring the community together," he said. George Stephanopoulos of ABC News interviewed Christine Leinonen, the mother of Christopher Leinonen, a young man who went missing inside of the club at the time of the attack. "Please, let's all try to get rid of the hatred and the violence," she said, sobbing. Leinonen later confirmed to ABC News that her son was among the dead.